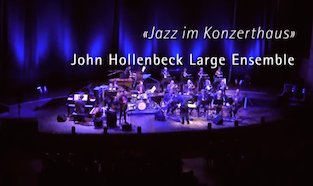 John Hollenbeck is one of the rare artists who have mastered the tradition of big band composition while crossing aesthetic boundaries and speaking directly to the time we live in today. His music is a daring mix of pure, heart-on-sleeve lyricism and robust rhythmic propulsion, and an audacious example of the power of big band jazz to express emotions well beyond swing-era clichés. His music for this group has earned acclaim for its rich, panoramic orchestral textures that retain the power of its members’ individual voices. 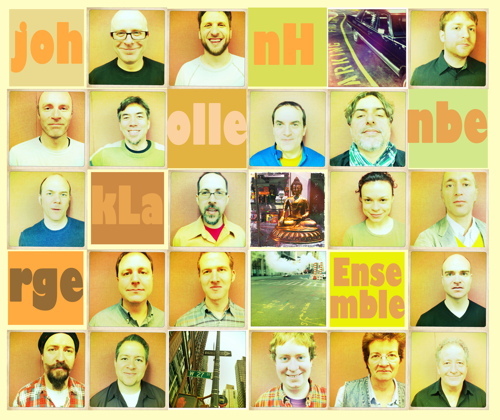 Unlike most contemporary big bands, this is no random agglomeration of freelancers – the John Hollenbeck Large Ensemble is an actual band consisting of top New York musicians. John had been writing for big band since he was in college at the Eastman School of Music and eventually formed the John Hollenbeck Large Ensemble in 1998 as an outlet to write the kind of music that wasn’tbeing written for this style of big band: “I saw some things that could be done that weren’t being done, and I thought there might be some other possibilities with a group that still has traditional instrumentation but the music itself is not traditional.”He gathered together a core group of musician friends who he had studied with at Eastman, and then selected a group of New York City musician friends and colleagues to complete the ensemble, creating a fine balance of camaraderie, integrity and talent – the perfect outlet for the creative expression of his music.